What a weekend. I was awake at 5:15am on Saturday so I was up in time to watch the opening ceremony. Mornings are not my thing, but I was pumped, and have stayed pumped since. It’s an interesting phenomenon really, isn’t it? Even just watching people have fun and get exciting about these games that we play can transcend time and distance and be felt through a computer screen thousands of miles away. Amazing. I’m slowly winding down, but am still buzzing a fair bit. There are also a few panels that some website folk were lovely enough to video for panels that were covered by the Virtual Ticket that I still need to watch (and the irony of that website being one I criticised very heavily in my last post is not lost on me!). So because I’m still pumped, and because I still have more information to soak up, I’m not going to talk about what has been learned yet. I want to be able to talk about it with a clear and unbiased mind. At the moment I’m still all “Blizzard is the best! That was amazing! I love everything! !” etc. and I don’t trust my thinking just yet. Some processing time will do me good. TRANSMOG TRANSMOG TRANSMOG!!!! Holy moly it was everything I could have asked for and more. I will admit that there were genuine tears in my eyes during those announcements. Amazing. And great evidence of Blizzard listening to our wishes, no matter how big or small they may be. Scaled questing zones – lets you level in whatever order you want to. YES PLEASE. The competitions – the sound was awful for the bands, so I felt bad for them. But the videos and the cosplay were out of this world. I was audibly gasping as each of the cosplayers came out – really phenomenal work this year. And while none of my favourites even placed, it was still a lot of fun to watch (and I just adore Wil Wheaton) You can check out some pics from the cosplay competition on wowhead here (the official Blizzard pics aren’t up yet). Legion Cinematic panel – I really enjoyed this! I would like to have heard some information on the music side of things as well, but there was limited time. Very fascinating to get some insight on how they put together the cinemantic, though. Starcraft World Championship final – I caught the last half of the grand final. I had absolutely no idea what was going on, but it was fascinating to watch. I loved hearing everyone gasp when something interesting happened, and the cheering when someone was making a strong attack on the opposition. Like I said, no idea what was happened, but it was lots of fun to watch. I may get in to esports yet! There’s heaps of other content that I really enjoyed that I’m forgetting right now. Yeah… still buzzing too much to be coherent. 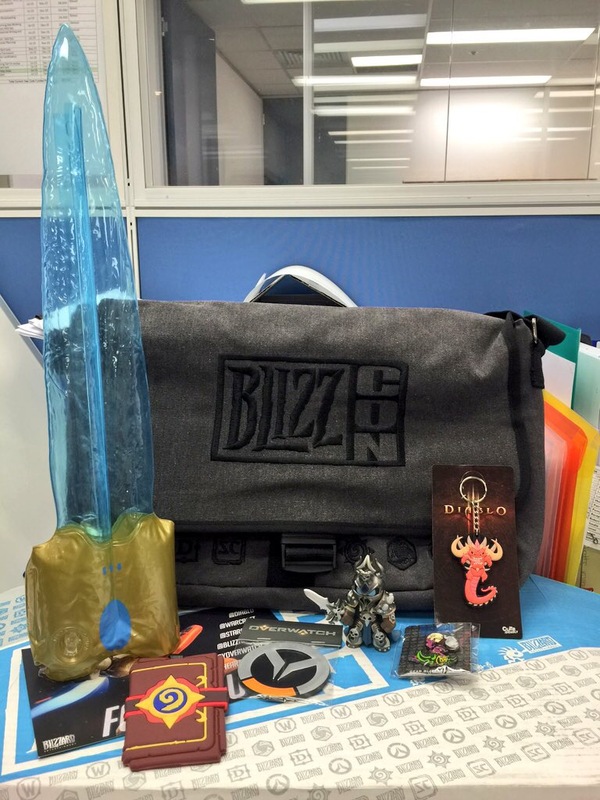 In the meantime, my Blizzcon Goody bag just arrived at work! I’m pretty happy with it. The little vinyl pop I got was Lich King which I’m pleased with – he’s adorably evil! 😀 The bag itself is also going to be very useful as I’m looking at getting the iPad Pro when that comes out and will need a bigger bag to carry it around in. So overall I’m pretty happy with it. One thing that I would suggest everyone keeps an eye out for is a series of blogs that Blizzard will be posting over the coming weeks about the class changes that are coming in Legion. It’s called the Legion Class Preview Series and will go through the expected changes coming for each of the classes. As I’m typing this they have released the initial blog post explaining what they will cover, and the Hunter class post has just been published. The initial post has a timetable for when each class is due to be published with links to each class as they’re done, so you might like to check out when yours is due! ← The cranky pants are on! I’m not much of a morning person either so found myself exhausted after that systems panel on Sunday. Totally excited about the transmog changes, scaling zones and profession info but 10 months is a long time to wait. They will definitely need to add something to keep people logging in. I still have my bucket list so I’m ok.
Yeah I had a quick nap after the Q&A because I was pretty wrecked by then too. My bucket list is getting longer and longer, to the point where even if the game doesn’t come out until September, I doubt I’ll get through it all in time. Which is a good thing I suppose. It will be interesting to see if they do add anything else to keep people logging in, but I’ll be honest – I doubt it will happen. And part of me hopes that they don’t, because I would rather all hands were on the Legion deck instead of adding other stuff to WoD.